Evan Levine, MD, author of What Your Doctor Can’t or Won’t Tell You. On Sunday January 24, 2016 I had a second ride in an ambulance and a second admission to Froetdert Hospital. My mysterious symptoms, kicking up for the third time in as many months, finally had a name. Acute Pancreatitis. Surgery, laparoscopic removal of the gall bladder on Tuesday, discharge on Thursday the very day I was supposed to fly to Arizona for a week of sun and fun. So much for life in the fast lane! 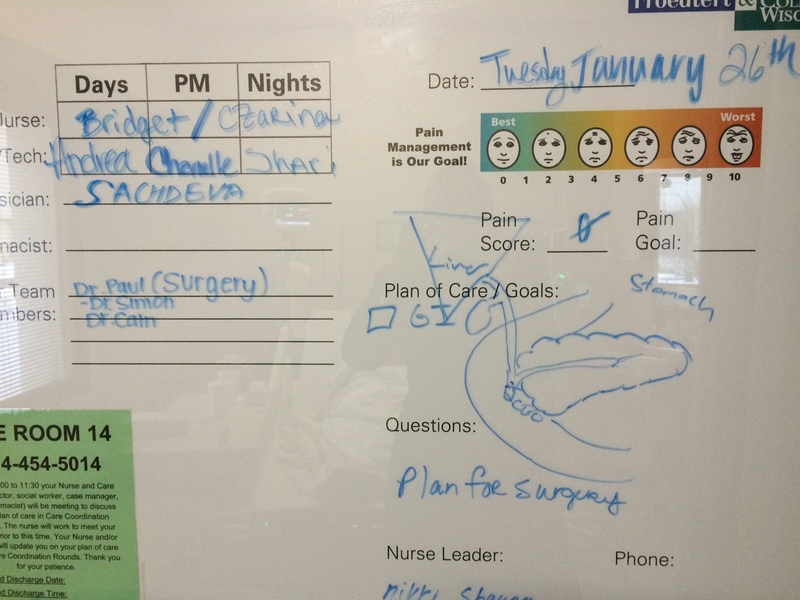 By early Sunday evening, I’d barely gotten settled into my room and the surgery team visited. I had an attending, a resident and two medical students standing in a circle at the foot of my bed. I couldn’t help but recall in my past when I’d done hospital rounds with residents at St. Mary’s Hospital. Now I really know how patients felt. The team asked and listened then laid out their plan. The possibility of surgery was looming. Later, a young man sheepishly knocked and wondered if he could ask a few questions. He described himself as a lowly first year medical student, still too new to be active in my care but wanting to do some research on pancreatitis. He was organized and professional. When I asked a question he rose, went to the white board, drawing a picture of my organs, explaining everything in detail. Where they were, how they worked, what was happening. During our chat about medical school, it was a natural segue to describe how I used to evaluate the interviewing skills of family practice residents. He perked up. How did I do? he wondered. I gave him high marks, commenting that he wasn’t hesitant to be personable and show his sense of humor. I advised him not to lose his humanity. That had been my most impressive memory from my days teaching behavioral medicine in a family practice residency. The medical school experience pounds the compassion out of young, energetic students who evolve into the right-brain, thinking scientists they must become. Often that leaves out the art of medicine. I left that job thinking it was a dirty trick how in residency it was suddenly important to evaluate bedside manner when this had not been given much attention up to that point. I have great respect for what it takes to become a doctor and totally get it that doctors have so much to think about and pay attention to that what falls away is all those touchy feely, not real medicine features. Next day, when the surgery team visited, the resident added a few arrows to the medical student’s drawing to further explain my condition. Later another resident and two more medical students would tell me how great it was that the labs on my pancreas had returned to near normal overnight. That meant surgery could go ahead. Was I passing gas, he asked. My yes made him happy. Is that good, I asked? Oh yes, that means things are percolating. I’ve never been in a place where these bodily functions were cause for celebration. My trip down to the surgery department and to one of the forty operating rooms was surreal. Out like a light after personally meeting and shaking hands with the surgical resident, the anesthesiologist and nurse. Back to my room. My attending, a hospitalist, had assured me at admission that he was in no hurry to release me and this turned out to be a relief. I was no longer that young, healthy woman who could snap back in an instant. I needed that extra day. Finally, ready to go I did a mental review of those five days. No eating or drinking anything, only ice chips. On continuous IV fluids with a bed board to keep my arm straight so the beeper would stop going off at all hours. To the bathroom every forty-five minutes day and night. Finally a clear liquid diet for the last two days. I couldn’t wait to get home to some real sleep and real food. And that’s when the serious thinking about the whole experience began. A conversation with my friend, Jane who is an RN, was especially enlightening. When telling her of my wonderful experience in a teaching hospital, she recalled how she had started out saying she didn’t want students involved in her care. That had been me too. But after working in a residency program we came to understand the importance of our contribution to their learning experience. I remember being especially unnerved the first time I heard the medical school mantra: see one, do one, teach one. It was comforting to know that the medical students and residents did nothing, absolutely nothing, that wasn’t under the close supervision of an attending doctor. And now I’d experienced it first-hand. These days, I always say yes when asked if a student can take part in any medical visit or procedure. As a medical education insider, I certainly know my view of these proceedings are different than those of the usual patient. But I came away grateful that this top notch medical facility is within ten minutes of my home. I just hope I’m never transported there again.